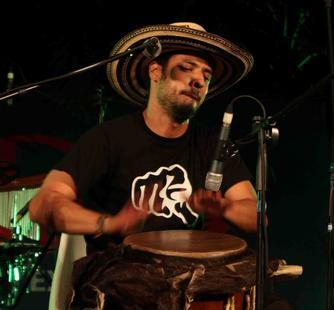 Fabian Sanchez is a percussionist from Cali, Colombia who specializes in Colombian traditional music. He is a member of a number of projects, such as Mama Julia Y Los Sonidos Ambulantes, dedicated to the preservation of his country’s native music, a mix of Afro-Colombian rhythms with elements of rock, funk and jazz. In addition to performing and sharing the music of his country, Fabian is also a teacher at different schools and foundations in Cali, among them the Instituto Popular de Cultura, Fundacion Sidoc – Tambores De Siloe, and the Centro Educativo Etievan Colegio Encuentros.